We wanted to share an email we received last month. We asked Chantal if we could post her email to our blog and she agreed, hoping to shed some light on what she dealt with. Chantal used our service and finally had her passport approved, but we recommended another photographer in the Lincoln, NE area who was willing to provide her with electronic versions of her Canadian passport photos for assessment by us prior to submitting her passport application for the 5th time. Needless to say, she was finally approved last week. I’m hoping you can help me. I live in Lincoln, Nebraska, and have sent my passport in to Passport Canada more than 4 times ($35 each time with next day Fedex) after having had my pictures done by Costco and taking one of the government’s online passport apps. The first time, I called them after 2 weeks and stayed on the phone for more than 30 minutes waiting to talk to an agent, only to find out nothing about my application’s progress. This was 3 months ago, and I’ve been putting off a long overdue trip home because of this. The last 3 times I was rejected were because of continued issues with my photos, yet they keep on referring me to the guidelines for the photos that they include in the applications with little other explanation besides this sheet they include with boxes checked off. The photographer is insisting that there is nothing wrong with the photos, yet Passport Canada is adamant that the photos don’t meet their specifications. I’m desperate. I’d like for you to take a look at what was produced and suggest something here. I don’t know who is wrong and who is right, and this is getting really expensive having to courier the application in with new photos every time. All I want to do is go home and visit my niece. Canadian Passport Photos can be rejected for a variety of reasons (most often lighting or facial expressions). Up to 50% of them submitted by post or courier from the United States will be rejected as a result of improperly filled out forms and bad photos that don’t follow the guidelines of Passport Canada’s expectations. 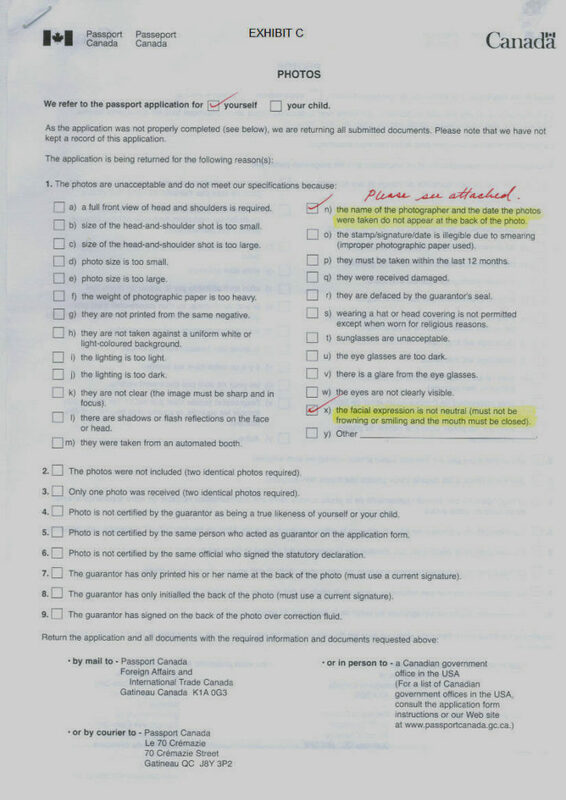 The photo component of your Canadian Passport Application or renewal application is what is the most harrowing, since not all photo suppliers in the U.S. are a.) willing or b.) capable of producing what Passport Canada is looking for, even if they’re claimed specialists. We receive emails or phone calls like this every week, and this is why we introduced our photo assessment service as a deterrent to an application’s rejection. Just because the photographer says it will be ok, that doesn’t make it ok. This is why we also started posting our commercial photographer links as a useful tool for Canadian Passport application in the United States. We have a Canada passport from someone in Ghana who claims to be from Canada and has provided us with a Passport copy. One of my attornies in Ghana tells me that the Canada passport looks fake, phoney and not legitimate. I cannot find on the internet, google any examples of a legitimate passport. Andy quick suggestions as I need verification of the passport immediately. Thanks for your comment. You can email us a scan of the passport at info AT canadapassporthelp DOT ca, and we can give our opinion if you’d like.